A hat-trick from Eli Hey gave Halifax Irish Club a 3-1 win over Ovenden WR in last night’s West Riding County Amateur League clash at West Vale. 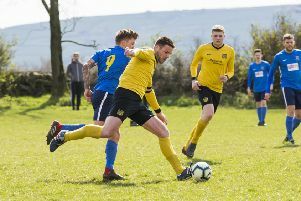 The eagerly-awaited Premier Division derby was virtually over as a contest in the 30th minute when Hayden Kerris and Scott Eastwood were dismissed for alleged comments to the referee. This meant West Riding’s already under strength side had to play the remaining 60 minutes with nine men. After both sides had gone close to opening the scoring, Eastwood converted a 15th minute penalty for Ovenden. Hey levelled the scores and then added a second from 18 yards to put his side 2—1 in front. The two dismissals left Ovenden with an impossible task but they put up a valiant rear guard action. Hey completed his hat-trick late in the second half.